Have you ever thought how wasteful it is to flush the loo with drinking water, when there's so much grey water being produced by our daily activities? This easy project adds a basin directly to the top of your toilet's cistern, so that when you rinse your hands, brush your teeth, etc, the grey water flows straight into your cistern, making it easy to flush with grey water. Only a few tools are needed, and the system is not destructive to any part of the toilet - you can switch back at any time. Cut along the line with the jigsaw. Cut slowly and carefully. Remember to use eye protection and a mouth mask when cutting! Place the plastic container on top of the lid you've cut. You may want to use a measuring tape to make sure they are centered. With a hole-saw attachment that matched the diameter of the waste-outlet, drill a hole through both the container and the lid. I drilled the pilot hole through both whilst they where on top of each other, then the larger hole separately. Make sure the drill bit and hole saw attachment don't damage the surface you're working on (consider drilling on a scrap piece of wood). Note: it's worth looking how your flush mechanism works, and placing the waste outlet accordingly. Ours ended up getting in the way of the flushing mechanism, so we had to angle-grind it down a little. Push the waste outlet through the holes. A rubber washer came with the outlet, and we placed that on the very top of the thread, so that it sits in the basin. Tighten the screw well, so as to avoid leaks. Cut down the wooden square pole to the height you'd like you tap to stand. Using the spade-bit in a drill-press (or drill), drill a hole near the top of the wood. Cut the dowel to the length you'd like your tap to stand over the basin. Insert the dowel into the hole you've drilled. Drive a woodscrew through the side to hold it in place. With a washer in place, drive the long wood screw through the hole, and into the wooden stalk. Using a bit of plumber's tape around the threads, attach the braided house to the water outlet. Use the shifting spanner to make sure it's tightly connected. Slowly turn the water outlet back on, making sure there are no leaks. You're done! Enjoy saving water! Some water creeped under the basin (not much at all). Applying silicone sealant near the waste outlet would solve this. The thread at the bottom of the waste outlet was quite long, and it got in the way of the waste mechanism. Placing the waste outlet to the side would've avoided this. Thanks for following this instructable! I you have any suggestions, questions, or comments, please leave them in the comment section. Great DIY solution! They sell these in the U.S. on the Home Depot website, or Amazon, for anywhere from $99 to $150, and entire new toilets with a built-in sink on top for over $350. This is a great way to put the conservation into practice right away, and in an economical fashion. Congrats! Excellent idea! How do you get the gray water into flow into the container? I must be missing something here... you disconnected the braided hose from the water inlet, then connected your faucet to the same water inlet. All you did was turn the loo from an automatic refill to a manual refill. Where does the "grey" water come in? And why would you want to use dirty water to flush your toilet? I think it would be better to use the " If it's brown flush it down, if it's yellow let it mellow" method. You don't get it - the toilet filling water is coming from hand washing and teeth brushing. I can't really understand why people are saying "this won't save any water..."
Of course it will save water - where would the water you normally use in a basin go to? It's wasted. This connects this grey water to the toilet cistern. The way I understand your instructions is that the drinking water that was going into the toilet tank is now going into the garden tap you added. Where does the "grey" water come from? Do you carry it from a basin in the sink where you washed your hands or brushed your teeth? Do you have a separate water collection for "grey" water vs. "black" water? How much more complex would it be, to take an existing sink from the bathroom, and mount it on top of the toilet? It would increase the available floor space in the bathroom quite a bit. With a little bit of handiwork, I think it could be a good weekend project! Since the sink would already have the drain, I guess one only need make the hole in the toilet lid. Is there a reason why you didn't drill through the original toilet lid? Is it difficult to drill though ceramic/porcelain? I've enjoyed seeing your project. Given the way a standard toilet is designed to flush and re-fill. this solution would not save/re-use any water - though it would add grey water to the water used to flush your toilet. If you look into the toilet tank, you will find float mechanism that controls the fill valve for the toilet so that the incoming water shuts off once the tank has been filled to the proper level. If you were to over ride this float (hold it down, for instance), the water would continue to flow into the tank. At some point the water level would rise above the elevated drain tube designed to prevent over-filling should the float valve fail. Thus, after you flush your toilet, the tank is automatically re-filled. If you were to use this basin, the water running down its drain would fill the tank a bit more than the level set, then run down the overflow tube into the toilet and out the toilet drain. Another short-coming is the implicit requirement that one use this toilet-mounted sink to wash their hands and brush their teeth. While, I suppose, not necessarily unsanitary - definitely less than appealing. Although, as my wife reminds me, they use a similar combination fixture (usually out of stainless steel) in many prisons. Hello! The inlet to the cistern has been disconnected here, so the toilet does not automatically fill. The only way it fills is through this basin. Although, I have been thinking that if we had left it connected, if you washed your hands quickly after a flush, it would add to the cistern while it is still filling, saving a little water (although I haven't tried this). Interesting note about prison fixtures, I'll have to take a look at those! My apologies, then, for not reading fully! Better still, just use a bucket of rainwater. Main advantage is that it's soft water, so no descaling chemicals if you live in a hard water area. I have sized it up a bit to cover a lot of other things, but so far, used about 40-tonnes (40000-litres) of rainwater. Bills cut to absolute minimum. Makes all sorts of washing a pleasure. Have to agree with comment that it makes no sense to flush waste away with drinking water - takes a he amount of effort to produce, then rendered useless in the WC. For second cistern, read second large header tank in the loft area. It's all part of a much larger rainwater collection system which has evolved over the years and includes a sand filter at the roof downpipe end. To keep the water sterile, I add a dash of sodium hypochlorite (domestic bleach). why not use something more sustainable (and nicer to the eye) than a plastic box, for the basin? a metal salad bowl, for example, ok, a bit more tough to cut but not impossible either. and if it's about being cheap i guess you can find one at a Good Will Store, or flea market. 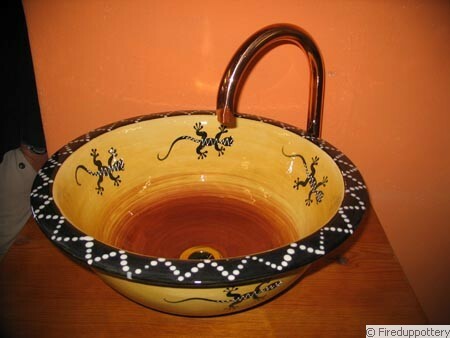 What I saw on my last trip to South Africa were pottery-bowls used as sink for hand washing. Should be easier to install than a "real" basin and looks cool.